The brother of Gabriel Garcia Marquez says that the Colombian writer and winner of the 1982 Nobel Prize for Literature is suffering from dementia. "He has problems with his memory. Sometimes I cry because I feel like I'm losing him," he said. He says the author has stopped writing altogether. 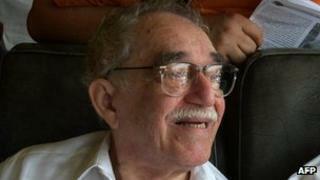 The BBC's Arturo Wallace in Colombia said there have been rumours about Mr Garcia Marquez' memory problems. "He is doing well physically, but he has been suffering from dementia for a long time," he said. "He still has the humour, joy and enthusiasm that he has always had." "It is a disease that runs in the family," said Jaime Garcia Marquez. His novels include Love in the Time of Cholera, Chronicle of a Death Foretold and the The General in His Labyrinth. He is best known for One Hundred Years of Solitude, which has sold more than 30 million copies and been translated into more than 30 languages .